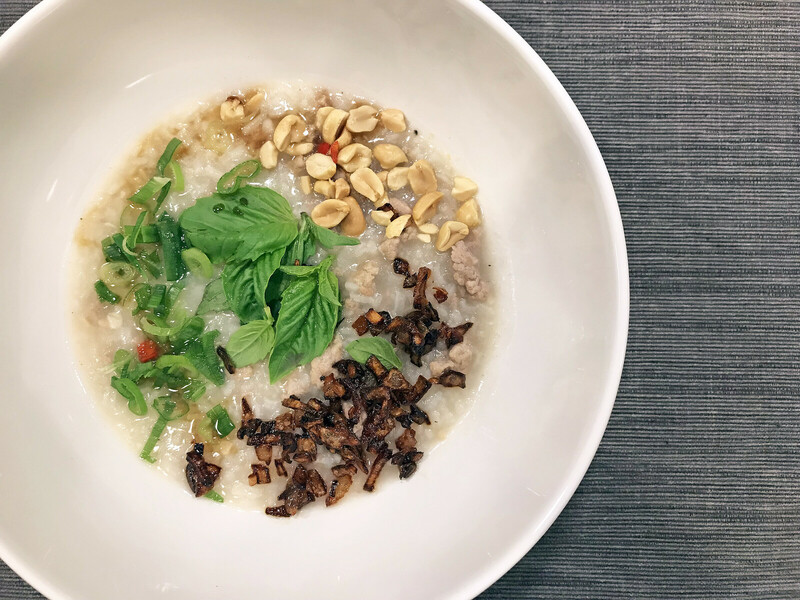 Congee, jook, bubur, porridge — whatever you call it, it’s the ultimate comfort food in a bowl, and an endlessly adaptable one at that. 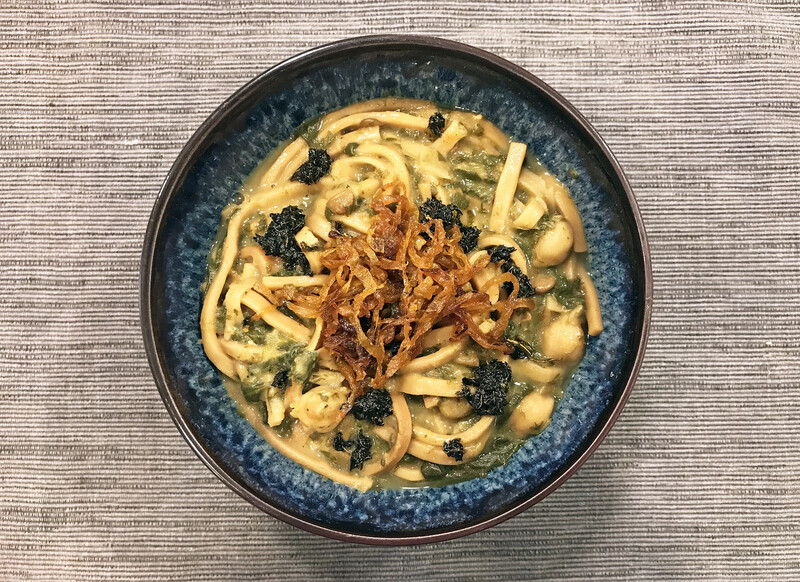 Topped with fried shallots, drizzled with sweet and salty soy sauce, served alongside Chinese doughnuts or a soft-boiled egg — the possibilities are endless. Whenever I travel to Asia, I eat a lot of congee, especially for breakfast. One of my favorite ways to prepare congee is Singaporean-style. This version uses sticky rice as well as short-grain rice for a creamier version, but you can use simply regular short-grain rice for equally delicious results. 2. When the rice has been cooking for 30 minutes, put the chicken in a bowl, sprinkle with cornstarch and toss to coat. Add the soy sauce, rice wine, sesame oil, sugar, and ginger. Mix and set aside. 3. When the rice is porridge-like, add the chicken and its marinade. Stir well and simmer until the chicken is cooked, 7-10 minutes. 4. 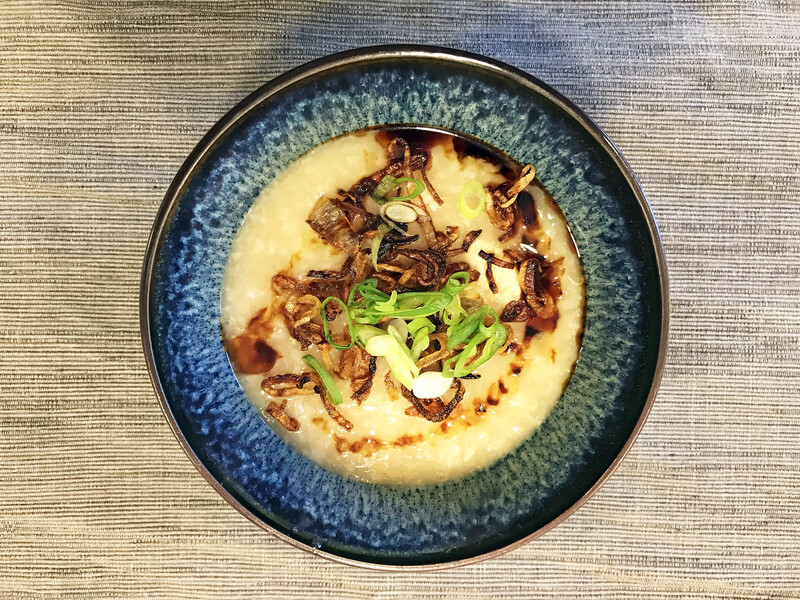 Transfer the porridge to serving bowls and top with the crisp-fried shallots, green onion, and pepper to taste. Serve accompanied with more soy sauce for adding to taste. This coconut curry is the kind of dish that tastes too good to be healthy. 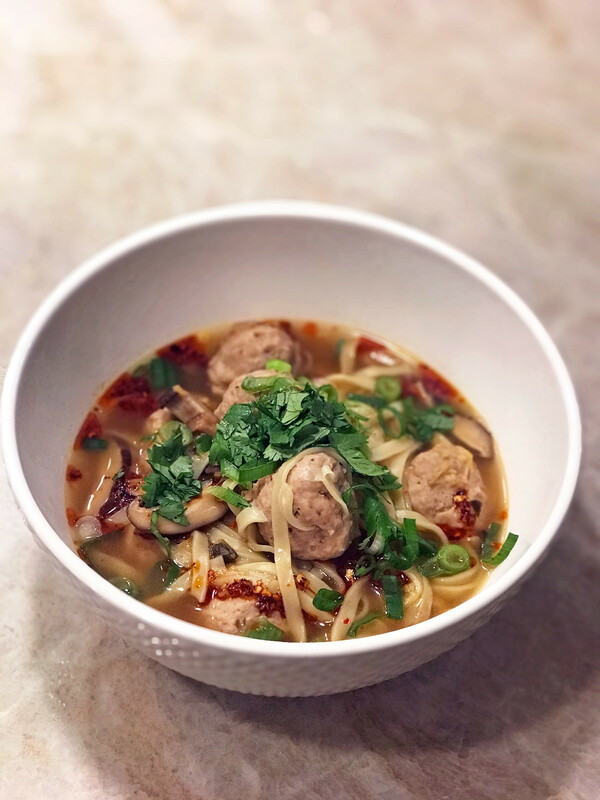 Brimming with greens and herbs, this meal in a bowl comes together in about half an hour. 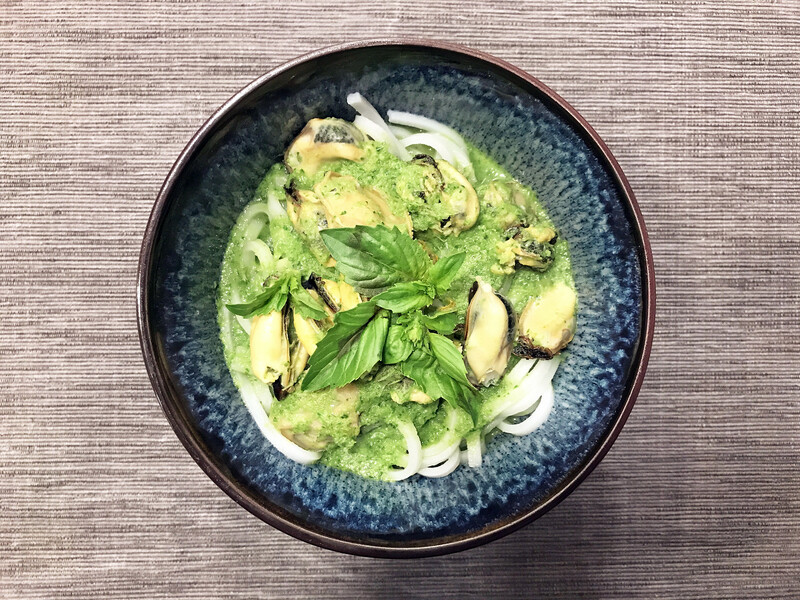 I love everything about this dish: the vibrant green, the creamy coconut, the salty mussels. Oh, and rice noodles. Gimme all the noodles. 1. Puree chile, ginger, lemongrass, garlic, fish sauce, brown sugar, and 3 cups water in a blender until smooth. Transfer curry to a bowl. Reserve blender (no need to clean). 2. Puree coconut milk, cilantro, 3 cups basil, and 1/4 cup cold water in blender until smooth; set herb puree aside. 3. Heat oil in a large saucepan over medium-high. Add mussels, cover, and cook until mussels open, about 7 minutes. Uncover and transfer opened mussels to a bowl, reserving cooking liquid in saucepan. If any mussels are still closed, cover and cook a few minutes longer, then add to bowl with others; discard any mussels that don’t open. 4. Add curry base to saucepan and bring to a boil. Reduce heat and simmer 10 minutes. 5. In the meantime, cook the noodles according to package directions. Drain and rinse under cold water. 6. Pour any accumulated mussel-cooking liquid into curry mixture and stir in herb puree; bring to a boil. Immediately remove from heat and add reserved mussels and squeeze in juice from lime. Taste and season with salt if needed. Serve warm in bowls and garnish with reserved basil leaves.